This is a clearance listing. Items may not match what is in the picture. You will receive a bag full of extra leftover crafted pieces from the shop, either from returns or mistakes made while painting. 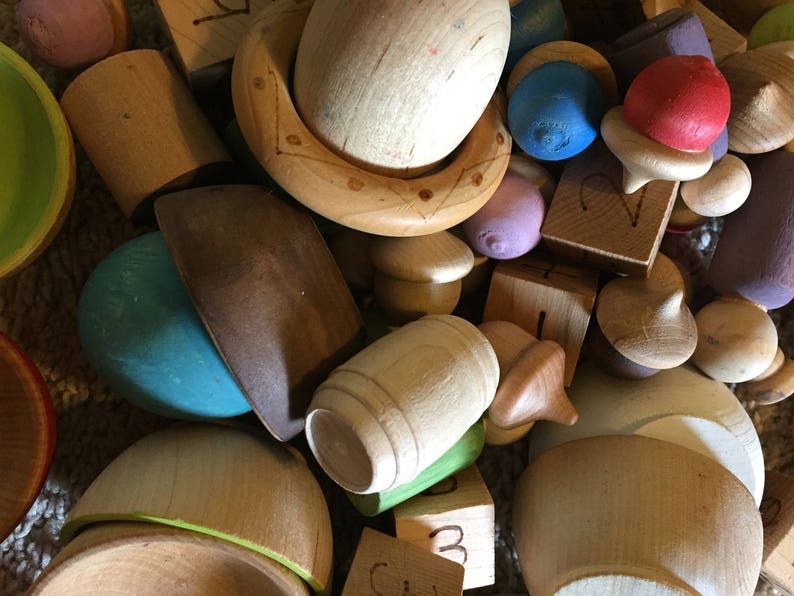 There will be an assortment of fun stacking and playing wooden pieces. Please note that many of the pieces are not painted. These make a FUN play set for your child. Build, stack, count, and be creative with this one of a kind set! All of our toys are hand crafted to order. The grain of the wood on each pieces is unique and holds the paint differently, giving each bowl and acorn a special rustic look. We do not coat our wooden toys in paint--we prefer to let the natural wood grain show through the color, creating a natural toy for your child. All of our painted toys are not recommended for children who put objects in their mouth and should not get wet. All of our unpainted toys are perfect for these younger children! Adorable and look exactly like this. Kids love them.